Magnolia House, built in 1923 is a designated Historic Texas Landmark. 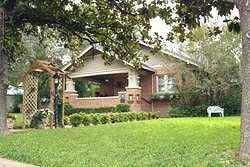 Restored in 1991 this Craftsman style home reflects the grand interior and comfortable family lifestyle of the original owners. Three uniquely decorated bedrooms and two suites (each with fireplaces) and all with private baths, invite you to relax and unwind. All the rooms have AC and heat, ceiling fans, cable TV with VCR, CD player, and monogrammed terry cloth robes. Guests gather each morning in the dining room to enjoy a full breakfast, starting with fresh fruit, homemade muffins and juice. The breakfast changes every day, including a combination of waffles, French toast or crãpes, bacon, sausage, and an egg entree. Oftentimes sweet rolls, biscuits and gravy are on the menu. Everything is prepared from scratch and served on antique china and silver. Room/Suite rates range in price from $85.00 to $150.00. We accept American Express, Master Card, Visa, Discover, Traveler's checks and cash.